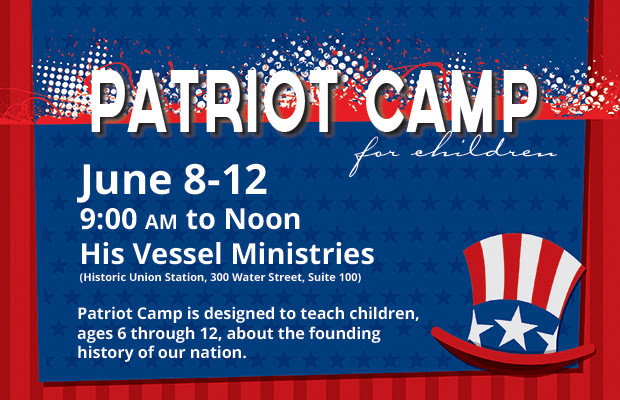 Call to register your children for Patriot Camp! $15.00 per child for the week! Each of the five morning sessions will focus on a different aspect of the establishment of America and will include the Revolutionary War, Founding Documents, American Ingenuity, Songs and Symbols, and the great founders of our Nation. The teaching curriculum includes not only learning the history about each topic but also fun-filled activities, crafts, and snacks. Also incorporated into each teaching topic will be how God was actively involved in the founding of this great nation. Copyright © *|2015|* *|His Vessel Ministries|*, All rights reserved.